Bali, Morning of the World, an island where cultural rhythms strike a perfect balance with its breathtaking beauty and tranquil surrounding has cast its magical spell on travelers for centuries. 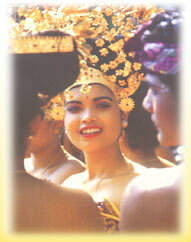 Where you can encounter a people whose mystical ways are enriched by a gentle and gracious culture. Be embraced by warm and genuine smiles and discover for yourself the magic that is Bali at Balihai Resort & Spa. Where you will be rejuvenated as the glistening blue waters of the Indian Ocean break rhythmically along Balihai Resort & Spa’s 500 meters of white sand beachfront just outside your door. The 151 generously sized Superior Rooms, 13 Kiddy Suites, 12 Deluxe Suites, 12 Family Suites, 9 Balihai Suites, 2 private villas – each with a private pool and 1 Presidential suite all feature modern conveniences and are decorated in a tropical fashion with a Balinese accent.